Like the frog said, it ain't easy being green, but I suppose if you're heavily armed as well, that'll help alleviate the stress. With his high-tech jet pack, Mask of Levitation, and wing blades, Toa Lewa roars into battle! Tall, strong and armed with a razor-sharp sword and Midak Skyblaster, he is a force to be reckoned with. So - jetpack, levitation, and wing blades? Is Lewa overcompensating for something? Maybe in a past life he was the only Toa who couldn't fly, and now he wants to make damned sure he'll never suffer that humiliation again. I dutifully checked the review of an earlier Lewa here at OAFEnet to find out, but it was just Shocka rambling about gorillas and pumpkins, so all it confirmed was what we've suspected all along, which is that living in Western Australia gets to you after a while. Let's assume Lewa's an aviation junkie and move on. 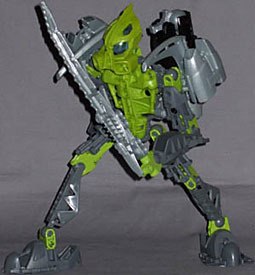 Physically, Toa Lewa is the generic hero of the three Phantoka Toa (good guys) - Pohatu's the stocky brawler, and Kopaka looks kind of like a stealth bomber, but Lewa's the well-proportioned, brightly-coloured, all-around warrior. Like all Toa-sized Bionicles he's got balljoints at the neck, shoulders, elbows, wrists, hips, knees, and ankles, and he conforms to the pretty standard Phantoka Toa frame, with the two-piece body with a coloured chestplate bolted on the front. His grassy green primary colour is a bit bright and cheerful, but there's a lot of gunmetal grey on him to balance it out, including the armour pieces on the green upper arms and thighs, which really help tone him down to a more serious overall appearance. His stand-out features are his shoulders, where he keeps his twin jetpacks, as well as a pair of forward-aimed scythe blades - presumably the "wing blades" the bio mentions, which actually serve the dual purpose of looking nasty, and giving the jetpacks something to plug into. He's not top-heavy as such, but with all that gear around the shoulders, plus the sturdy-looking mask/helmet, he looks a bit like an American footballer, but let's try not to hold that against him - Bionicle is a serious business, after all. 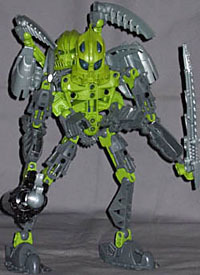 His mask is an interesting design, with two layers: the outer solid green, and an inner clear blue, which connect together and then attach over the standard Toa head. As the bio says, he's armed with his trusty Midak, and a sword. A big sword. It's 5½" long - Lewa himself only stands 9½" - and it's got a serrated edge on the front, wicked claw blades on the back, and electrical-looking segments in the middle suggesting it's a powered weapon, for extra killing potential. Compensating, told you. The Midak, as explained in the Pohatu Phantoka review, is a hellacious little bit of kit, loading four spheres and firing them with enough force to knock any Bionicle it hits, from Matoran right up to Titan-class, flat on its arse first shot. 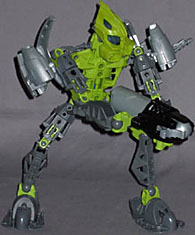 Like all Toa, Lewa gets saddled with a Matoran to carry around on his back - his is Tanma, with the matching colour scheme and blocky air intakes on either side of his mask's "jaw." For a change, the combination isn't completely ridiculous, as Tanma's smooth-edged swords are fairly suited to being flipped over and wielded overhand above Lewa's shoulders, where they echo his own shoulder blades visually. 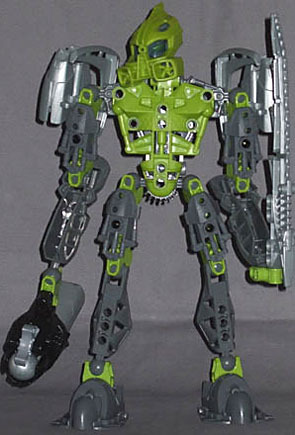 So he's your all-around Bionicle performer, is Lewa - he looks tough but agile, he can fly, he's got a big gun and a bigger sword, and for once the combiner feature kind of works. Whatever he was compensating for, this ought to cure him of it.